Nevada Physical Therapy | Rotator Cuff Tear: Surgery? No Surgery? 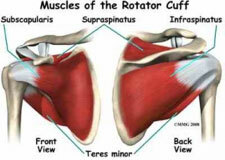 Rotator Cuff Tear: Surgery? No Surgery? Why does physical therapy help? Correctly dosed rehabilitation can help reduce pain, improve non-optimal movement strategies, and strengthen the intact rotator cuff tendon complex to improve your quality of life. Find out here what we think makes a good physical therapist. Diving into a little bit of the tendon science aspect, tendons respond positively to mechanical loading which is strength training. Tendons break down from cyclic loading which is repetitive motion activity. If you would like to learn more about tendons and how physical therapy can help reference here. Another aspect of physical therapy care is workload management, which is a key component to helping you return to the activities you love. Here, you will find our newsletter on workload management and how this can help reduce your risk of injury. In conclusion, correctly dosed rehabilitation including but not limited to, building tendon strength, optimizing your shoulder movement and positional tolerance, as well as workload management is essential to help you return to your prior level of activity and function. If you would like to find out more how we can help you, we offer free phone consultations as well as in-person discovery visits where you can come in and see what we’re all about! 1. Petri M, Ettinger M, Brand S, Stuebig T, Krettek C, Omar M. Non-Operative Management of Rotator Cuff Tears. Open Orthop J. 2016;10:349-356. 5. Kuhn JE, Dunn WR, Sanders R, et al. Effectiveness of physical therapy in treating atraumatic fullthickness rotator cuff tears: a multicenter prospective cohort study. J Shoulder Elbow Surg. 2013;22(10):1371–1379. 6. Dunn WR, Kuhn JE, Sanders R, et al. 2013 Neer Award: predictors of failure of nonoperative treatment of chronic, symptomatic, full-thickness rotator cuff tears. J Shoulder Elbow Surg. 2016;25(8):1303-11. 7. Edwards P, Ebert J, Joss B, Bhabra G, Ackland T, Wang A. Exercise Rehabilitation in the Non-Operative Management of Rotator Cuff Tears: A Review of the Literature. Int J Sports Phys Ther. 2016;11(2):279-301. Orthopedic and Sports Rehabilitation. All Rights Reserved.